Having a flexible body is important and essential for our general health and well-being and as we get older, it becomes necessary if we want to avoid injuring ourselves. This can happen in the simplest of movements such as twisting around to look behind us which uses our neck, back and shoulder muscles and can be strained if you are inflexible. Being flexible also helps to improve your posture which will make you look taller and make you feel more ‘open’ as your shoulders and back are not hunched forward. Your body will become more comfortable as well as your joints and muscles will not feel so stiff. The flexibility exercises in this article will give your body good flexibility overall and it is recommended that you perform these on a daily basis or every other day for at least 15 minutes each time. Start in a kneeling position, then bring your left leg forward into a lunge position so it should be at a 90 degree angle and your right knee should be flat on the ground. With your hands on top of your left knee, lean your hips forward and hold for 15 – 30 seconds. Then bring your left knee back to starting position and repeat on the other leg. In a standing position, put your left hand on the right side of your head and pull gently towards your left shoulder. You should feel a stretch in the side of your neck. Hold for 30 seconds, then relax. Repeat on the other side. Start in a standing position with your feet a hip width apart. Raise your arms and elbows straight above your head, back straight, chest forward and palms facing upwards. Next move your left leg forward into a wide lunge, touch your right knee to the ground and look upwards. Hold for about 10 seconds and then bring your right leg forward to return to the starting position. Repeat on the other leg and do this three times on each side. Stand with your feet hip width apart and parallel to each other. 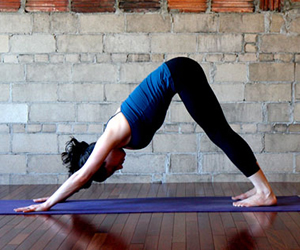 With your knees bent, bend over and place your hands flat on the floor. Walk your hands forward until your feet and hands are completely flat on the floor so your body is like an upside down ‘v’ shape. For beginners, keep your knees bent otherwise straighten your legs until you feel the stretch in your calves and hamstrings. Keep your head pointed downwards and make sure your neck is relaxed (you should be able to look at your lower leg/shin without strain), your core is firm, your knees are not touching each other and your hips are pushed back. Hold for 30 seconds. Start on the floor on your hands and knees with your spine straight and your head pointed downwards. Inhale and as you exhale, pull your belly in towards your spine and round your shoulders in and point your head inwards so you are looking at your legs. Hold for 15 seconds and then inhale as you return to the starting position. Repeat this 3 – 5 times. Sit on the floor with your legs extended out in front of you, your back straight and core engaged. Cross your right leg over the other and place your right foot flat on the floor in line with your left knee. With your left arm, push the outer side of your bent right knee and twist your head slowly to the right to look behind your shoulder. Hold for 30 seconds. Repeat on the other side. Stand with your feet a hip width apart, inhale as you lift your arms above your head and as you exhale, slowly roll your body downwards bringing your arms down and pulling in your abs in towards your spine at the same time. Make sure your knees are slightly bent as you roll down. Keep going until your hands touch your feet and slowly straighten your legs. If you are unable to do this, then place your hands on your shins instead. Keep your head pointed downwards and relaxed. Hold for 15 seconds and inhale as you return slowly to the starting position. Repeat twice. 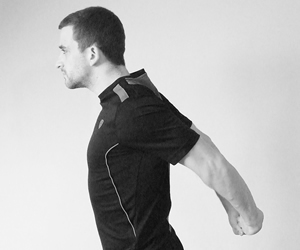 Focus – Triceps, shoulders and neck. Stand with your feet a hip width apart and your arms extended above your head. Whilst keeping your arm straight, bend your right elbow back so it touches your back and with your left hand, reach across overhead to hold your right elbow and pull it back and towards your head slightly. Hold for 15 seconds and repeat on the other side. Repeat twice on each side. In a standing or seated position with your back straight, bring your arms behind your back and clasp them together. Straighten your arms and slowly lift them upwards. Make sure your back stays straight and that your shoulders are not hunched. Hold for 15 – 30 seconds. Unclasp your hands and bring your arms forward in front of you about chest level and clasp them together. Straighten your arms but keep your back straight, you should feel a stretch in your lats and upper back. Hold for 15 – 30 seconds. In a standing position, cross your left leg in front of your right and lift your left arm above your head. Lean your head and body to your right slowly until you feel the stretch in the left side of your body. Hold for 30 seconds and then repeat on the other side. If you feel unbalanced during this stretch, put your right hand on a chair for support.